Oral Medicine and Pathology At A Glance is the ideal companion for all students of dentistry and recently qualified clinicians. 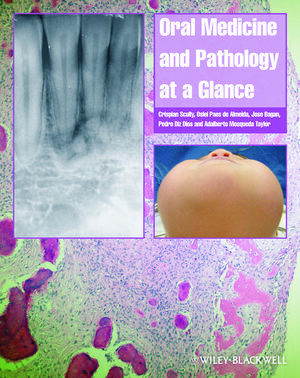 In addition, through its focus on oral health care provision in general practice, the text will provide valuable insight for general dental practitioners wanting to update their knowledge of oral medicine and pathology, dental nurses, hygienists and therapists. Crispian Scully is Professor of Oral Medicine, Pathology and Microbiology at University of London, Director (Special Projects) at the UCL-Eastman Dental Institute, and Professor of Special Care Dentistry. He also serves as Chair of Division of Maxillofacial Diagnostic, Medical and Surgical Sciences and is President-elect of the International Academy of Oral Oncology (IAOO). He is Visiting Professor at the Universities of Bristol, Edinburgh and Helsinki. Oslei Paes de Almeida is Professor in the Department of Oral Diagnosis and Pathology, Dental School of Piracicaba, University of Campinas, São Paulo, Brazil. Jose Vicente Bagan is Professor of Oral Medicine at Valencia University, Department of Stomatology, University General Hospital, Valencia, Spain. Pedro Diz Dios is Senior Lecturer in Special Needs Dentistry and Head of Special Needs Dentistry Section within the School of Medicine and Dentistry at Santiago de Compostela University, Spain. Additionally he is Honorary Visiting Professor at UCL-Eastman Dental Institute, University College of London (UK). Adalberto Mosqueda Taylor is Professor of Oral Pathology and Medicine at the Health Care Department, Universidad Autonoma Metropolitana Xochimilco, and Honorary Professor at the National Institute of Cancerology in Mexico City. 1 Examination of extraoral tissues. 2 Examination of mouth, jaws, temporomandibular region and salivary glands. Referring a patient for specialist opinion. 7 Anatomical variants and developmental anomalies. Fissured tongue (scrotal or plicated tongue). Stafne cyst or bone cavity. Angina bullosa hemorrhagica (localized oral purpura; traumatic oral hemophlyctenosis). 9 Blisters, infections: Herpes simplex virus. 10 Blisters infections: Varicella zoster virus. 11 Blisters, skin diseases: Pemphigus. 12 Blisters, skin diseases: Pemphigoid. Hairy tongue (black hairy tongue; lingua villosa nigra). 14 Pigmented lesions: Ethnic pigmentation and tattoos. 15 Pigmented lesions: Melanotic macule. 16 Pigmented lesions: Nevus and others. 17 Pigmented lesions: Malignant melanoma. 18 Red and purple lesions. 19 Red and purple lesions: Desquamative gingivitis, mucositis. 20 Red and purple lesions: Erythematous candidosis. Denture-related stomatitis (denture sore mouth; chronic atrophic candidosis). Angular stomatitis (angular cheilitis; perleche). Median rhomboid glossitis (central papillary atrophy of the tongue). 21 Red and purple lesions: Angiomas. Venous lake (venous varix; senile hemangioma of lip). 22 Red and purple lesions: Proliferative vascular lesions, Kaposi sarcoma. 23 Red and purple lesions: Erythroplakia. 24 Red and purple lesions: Erythema migrans (lingual erythema migrans; benign migratory glossitis; geographical tongue; continental tongue). 25 Swellings: Hereditary conditions, drug-induced swellings. C1 esterase inhibitor deficiency (hereditary angioedema). 26 Swellings: Infections, human papilloma virus. Multifocal epithelial hyperplasia (Heck disease). Crohn disease and orofacial granulomatosis. Giant cell epulis (peripheral giant cell granuloma). 29 Swellings: Malignant neoplasms, oral squamous cell carcinoma (OSCC). 30 Swellings: Malignant neoplasms, lymphoma, metastatic neoplasms. 31 Ulcers and erosions: Local causes, drug-induced ulcers. Eosinophilic ulcer (traumatic eosinophilic granuloma; traumatic ulcerative granulomatous disease). 32 Ulcers and erosions: Aphthae. 33 Ulcers and erosions: Aphthous-like ulcers. Behçet syndrome (BS, Behçet disease). 34 Ulcers and erosions: Blood diseases, gastrointestinal disorders. Celiac disease (gluten sensitive enteropathy). 35 Ulcers and erosions: Infections. Hand, foot and mouth disease (HFM; vesicular stomatitis with exanthem). Acute necrotizing ulcerative gingivitis (Vincent disease; acute ulcerative gingivitis, AUG, ANG, ANUG). 36 Ulcers and erosions: Erythema multiforme, toxic epidermal necrolysis and Stevens-Johnson syndrome. Toxic epidermal necrolysis (TEN, Lyell syndrome) and Stevens-Johnson syndrome (SJS). 37 White lesions: Candidosis (candidiasis). Chronic hyperplastic candidosis (Candidal leukoplakia). 38 White lesions: Keratosis, leukoplakia. 39 White lesions: Hairy leukoplakia, lichen planus. Lichen planus (LP) and lichenoid reactions. 40 Salivary conditions: Salivary swelling and salivary excess. Saliva excess (sialorrhea, hypersialia, hypersalivation, ptyalism) and drooling. 41 Salivary conditions: Dry mouth. 42 Salivary conditions: Sjögren syndrome. 43 Salivary conditions: Sialolithiasis, sialadenitis. Sialadenitis: Recurrent parotitis of childhood. 45 Salivary conditions: Mucoceles, sialosis. Mucoceles (mucous cyst; mucus extravasation phenomenon; myxoid cyst). Discrete swellings in the neck. Diffuse swelling of the neck. 47 Neck swelling: Cervical lymphadenopathy in generalized lymphadenopathy. Inflammatory disorders (not known to be infective). 48 Neurological conditions: Bell palsy, and trigeminal sensory loss. 49 Neurological conditions and pain: Local, referred and vascular. Local causes of orofacial pain. Referred causes of orofacial pain. Vascular causes of orofacial pain. 50 Neurological conditions and pain: Trigeminal neuralgia. 51 Neurological conditions and pain: Psychogenic (idiopathic facial pain, idiopathic odontalgia and burning mouth syndrome (oral dysesthesia)). Persistent idiopathic, or unexplained (atypical) facial pain (IFP). Burning mouth “syndrome” (BMS, glossopyrosis, glossodynia, oral dysesthesia, scalded mouth syndrome, or stomatodynia). 52 Jaw conditions: Temporomandibular pain-dysfunction. Temporomandibular joint pain-dysfunction syndrome (TMPD), myofascial pain dysfunction (MFD), facial arthromyalgia (FAM), mandibular dysfunction, or mandibular stress syndrome. 53 Jaw bone conditions: Radiolucencies and radiopacities. Mixed radiolucent and radiopaque lesions. 54 Jaw bone conditions: Odontogenic diseases and cysts. 55 Jaw bone conditions: Odontogenic tumors. 56 Jaw conditions: Bone disorders. 57 Jaw bone conditions: Fibro-osseous lesions. Osseous dysplasia, cemento-osseous dysplasia (COD), periapical cemental or cemento-osseous dysplasia (PCD). 60 Human immunodeficiency virus (HIV) infection and AIDS.